Milan’s La Scala theatre, as told by the protagonists of its golden years. Enzo Biagi was one of Italy’s most famous and beloved journalists. His fondness of the prestigious Milanese venue led to the programmes we are now presenting on DVD, made in 1981/82. 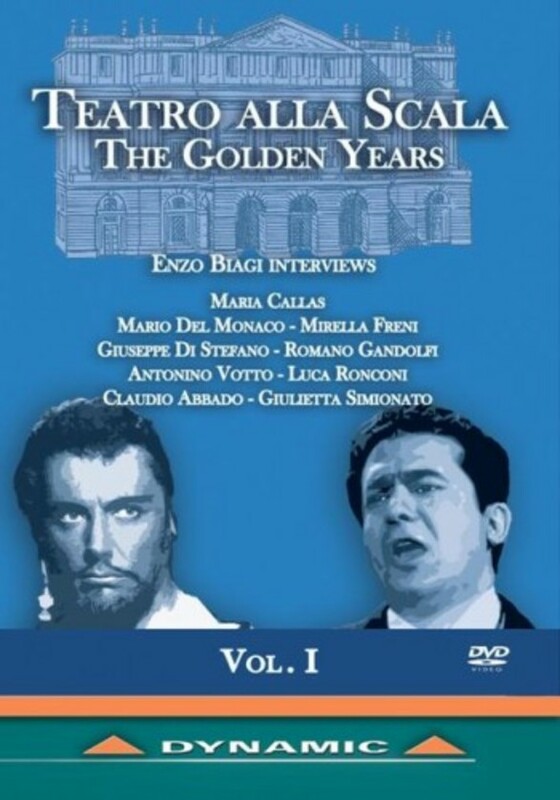 Documenting the La Scala productions of those years, Biagi entered the theatre during the rehearsals and interviewed the protagonists (conductors, singers and directors), not only the figures of those days but also the great stars of the past. The series was originally produced on 16 mm film, and is now restored and offered to the public at large by Dynamic. - Claudio Abbado and Giorgio Strehler together, in a 'behind the scenes' of Wagner’s Lohengrin which opened the 1981-82 season. - An undisputed star of La Scala in the ‘80s, Mirella Freni, a favourite with the public of La Scala. - Arturo Toscanini, La piccola Scala, and the Callas-Tebaldi rivalry in the words of Giulietta Simionato and Antonino Votto. - Les Troyens directed by Luca Ronconi, Giuseppe Di Stefano confides and a long interview with Mario Del Monaco. - And a short, unpublished interview with Maria Callas never seen before!